FOR THE MODELER: This review covers the AMT Fruehauf Texaco Tanker Trailer in 1:25 scale. This is a Skill Level 2 kit with over 100 parts molded in white and chrome and includes rubber tires and metal axles. The kit is out of production but can still be found in hobby shops and online as it was produced on multiple box arts and with different decals over the years. The latest release is the Shell Tanker Trailer kit #918. The kit builds up to represent a fuel trailer from the 70’s era but can still be seen on today’s roads. As for the buildup it is fairly simple with the main tank in four parts that assemble into a cylinder. The frame and chassis attach to that. For the advanced builders I would recommend using metal foil to create a chrome tank. The chassis fit is fair for its age and overall it builds up well. The decals in this boxing do represent the typical Texaco tanker of the period. Overall size is: Length: 20”, Width: 4-1/2”, Height: 6-3/4”. 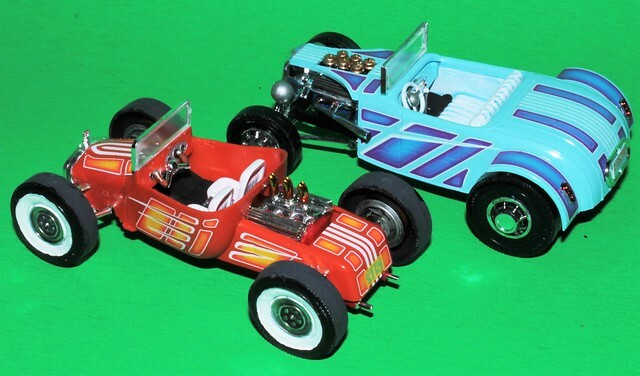 For the modeler: : This review covers the Re-release of the Customizable Show Rods 1:32 Scale Lindberg Model Kit #HL136 These have not seen a re-pop in many years. It is Skill Level 2 and requires paint and glue. You get ~50 parts to construct each model. 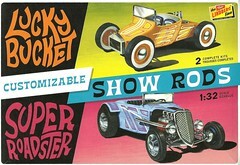 The Lucky Bucket Roadster is molded in orange and the Super Roadster is molded in blue styrene. These kits also include chrome and clear pieces with a set of waterslide decals and a cardboard display stand. The instructions are a simple fold out style. These are basic kits that are molded with customizing in mind as each model has three different configuration to make it a unique version. This is a simple and fun kit to build just like it was back in the day! Overall dimensions are ~: Length: 4”, Width: 1½”, Height: 1½”. Baron von Rot stood at attention. His commander, Air Marshal von Blitzkrieg, was there to award him the highest order of the Iron Cross – the Crossed Dog Bones! The baron had shown great bravery and mastery of the skies in his “Dog Fight” with the enemy ace code-named “K-9.” But in the back his mind – having seen his arch enemy parachute to safety – the baron knew he would have to face him again! 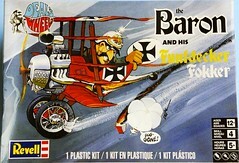 For the modeler: This review covers the recent re-release of Revell’s Baron and his Funfdecker Fokker plane from the Deal’s Wheel’s Series by Dave Deal. 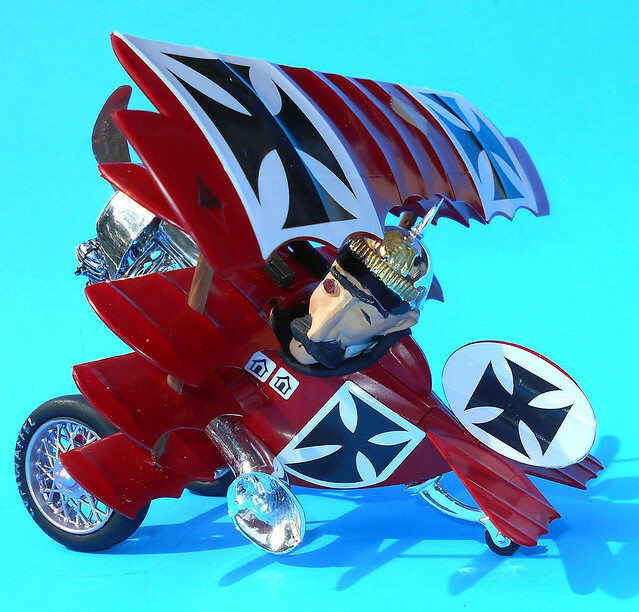 This is a Non-Scaled kit of a whimsical nature and unrealistic, it is a 5 winged Fokker with World War II markings! The kit is rated a Skill Level 4 and requires Glue and Paint. You get 50 parts molded in Red and Chrome and it includes a Waterslide decal sheet. The instructions are different as they are written in a comic style as if the Baron is instructing you, in broken English, how to assemble the kit. The whole kit has a humor about it and is quite fun to build. Overall assembly is not difficult and fit and finish is fairly good for a kit from the early 70’s. Overall dimensions are: Length: 6-3/16″, Width: 8-5/8″, Height: 5-5/8″.